clear span gable unsymmetrical metal buildings. The unsymmetrical building design is a double slope building and the ridge is off center of the structure. 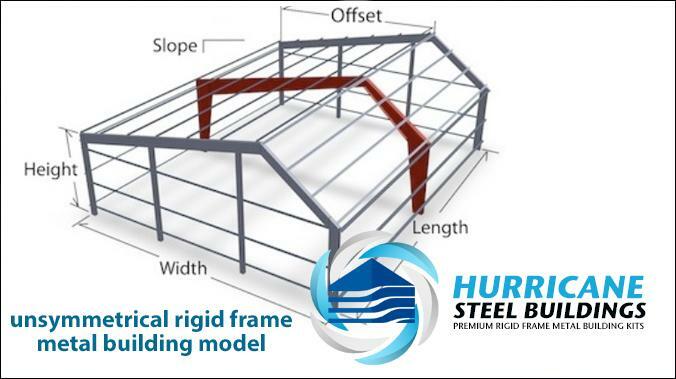 Hurricane Steel Buildings® unsymmetrical metal buildings kits are clear span gable symmetrical metal building kits that offer a custom gable roof line when one side has to be short than the other. With the roof peak placed unevenly to one side it allows you to customize where the needed height in the interior ends to be. The unsymmetrical design also allows you to expand by adding a new building without the space to have an symmetrical gable on both sides. The cost is less than the other 4 models as it requires less components including interior support beams. The strength of this building requires no need for interior posts or support beams. This unsymmetrical metal building is a true clear span building that features a gabled roof that comes in a wider variety of pitches and the interior has no posts or columns offering a true clear span interior unobstructed by support beams. The components and framing of this metal building require less steel which provides a lower price to buy and lower cost to erect. Most commonly these buildings are used for malls, retail outlets and warehouses. This type of metal building includes tapered sidewall columns and tapered rafters. You have the option of girt conditions to be bypass, flush or inset. Each building can be fitted with insulated cladding or panels, slide windows, overhead doors and walk through doors and ventilation options. Hurricane Steel Buildings® custom manufactures every clear span building according to AISC load requirements so that your building is strong and bears heavy loads and sustains sever wind speeds. 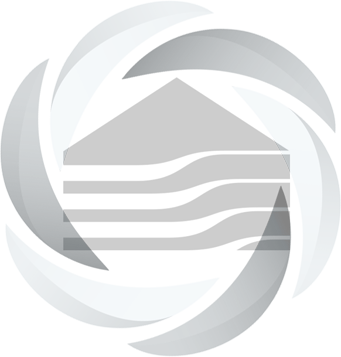 Custom build your unsymmetrical metal building using our online metal building price calculator and get instant prices according to your specifications. You can call us toll free at 833-834-8400 to further customize your clear span building with various features and accessories and ask about our clearance sale prices and metal buildings on sale.